The Toshiba Lectures in Japanese Art provide a public platform for a senior scholar of Japanese arts to present a research project which is already well-developed in a series of three lectures to a broad public audience. Hare and Moon. Dish (1690-1730). 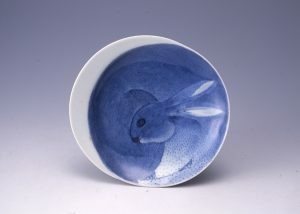 Porcelain with underglazed cobalt blue design. With the four-hundredth anniversary rapidly approaching, now is a particularly opportune occasion to re-examine the history of Japanese porcelain from a modern angle. This four hundred year retrospective of the evolution of Japanese porcelain affords multiple new interpretations. Many questions have long remained unanswered. For example, why did Japan only begin to produce porcelain for the first time around 1610, centuries after both China and Korea had mastered the technique? How, given its late start, was Japanese porcelain able to be exported throughout Asia, the Middle East and Europe by the 1660s to such high acclaim? Competition between kilns for market share both within Japan and abroad was rife. 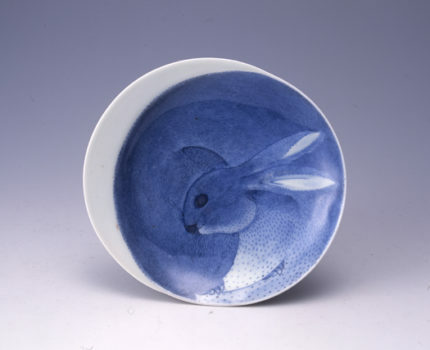 Not withstanding intrigues, government and trade restrictions as well as changing consumer tastes, Japanese porcelain has continued to flourish these 400 years adapting to market demand and to the latest styles. Today, porcelain production in Japan continues unabated both in traditional centres and by ceramic artists creating powerful modern expressions in new areas. Professor Rousmaniere in this series of three lectures uncovers the history of Japanese porcelain from its complicated birth through its strong export period to its powerful contemporary presence. Recent archaeological and art historical data are introduced to create a revitalised picture of the industry as a whole. New light will also be shed on the significant Japanese ceramics in the British Museum created by pioneering collector Augustus Wollaston Franks, first curator and then Keeper at the British Museum from 1851-1896. Nicole Coolidge Rousmaniere is Professor of Japanese Art and Culture at the University of East Anglia and Research Director at the Sainsbury Institute. She is currently seconded to the British Museum as a curator in the Department of Asia working on its extensive ceramic collection. Her research interests include medieval to contemporary ceramic history in East Asian trade networks, the history of Japanese archaeology, the collecting of Japanese artefacts and art objects in Asia and Europe, contemporary Japanese craft expression and manga. Places are limited and seats are allocated on a first-come, first-served basis.